Learn to Defend Yourself Against Violent Attacks. 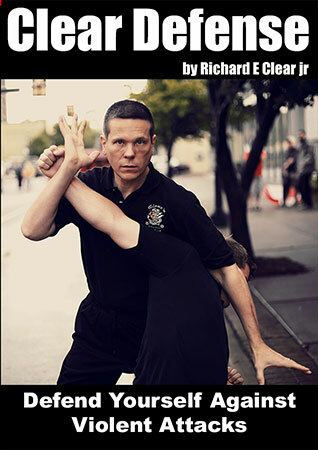 Learn a complete self defense method for extreme situations. It uses both hands, both knees, both feet and both elbows all at once. You learn to use your voice, your body language and your mind. You learn how to trigger the mind and body to fight like a wild animal in an instant. Make full use of your body’s natural weapons. 3 – 5 hits per second with full power. Overwhelm an attacker with a barrage of power strikes. How to keep from panicking so you never freeze up under pressure. How to win a confrontation morally and in a way that can be defended legally. How to get someone twice your size off your body. The Clear Defense method can be used by almost anyone. We’ve taught it to little old ladies and 70 year olds with heart conditions. How to beat the attacker to the hit every time. Move in a way so that you cannot be vitally hit. How to use an ink pen for self defense. How to defend yourself when you’re surrounded. Click Here to Save over $280 with the Clear Self Defense Certification Package. Sigung Clear first began study the martial arts because he lived in rough neighborhoods and needed to defend himself on a regular basis. He’s now spent over 35 years traveling, researching and training. Constantly working to find the most effective ways to survive bad situations. That pursuit has led him to an in depth study of Kuntao, Pentjak Silat, Tai Chi, Xing Yi, Bagua, Systema, Kung Fu and other arts. He’s studied knife, stick & firearm tactics. He’s done extensive research on violent attacks, how they happen, how victims respond, how the body & mind respond to extreme stress and the psychology of criminals. What’s the one thing Sigung Clear would use for self defense above all others? He’s been teaching it in a course we call Executive Transformations. The program is very effective but there’s one problem. It’s great for executives who need self defense and don’t have time to train martial arts. …but it’s out of reach of most martial artists. So, we’ve taken the fighting method and put it on video. Now, we can’t guarantee the same level of results as the 3 day course because we’re not running you through two and half days of intensive scenario training. Click Here to Save $280 with the Clear Self Defense Certification Package.